The BSPC at the 51st General Assembly of the PABSEC: Pettersson points out the value of our democracies and the need to stand up and fight daily for them. 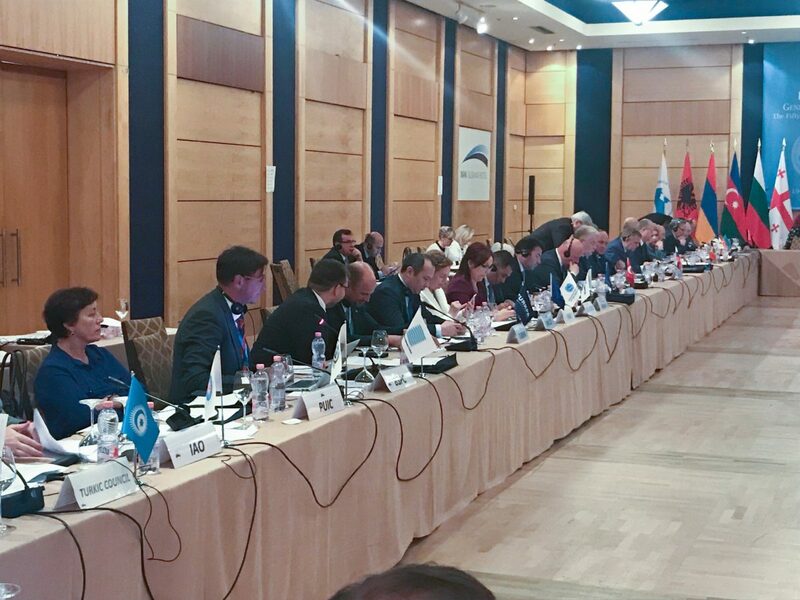 BSPC President Jörgen Pettersson and the head of the delegation of the Finnish Parliament to the BSPC, Kari Kulmala, attended the 51st General Assembly of the PABSEC in Tirana. In his address to the Assembly, Jörgen Pettersson highlighted the close cooperation between the BSPC and the PABSEC, based on a memorandum of understanding and common topics as well as the value of our democracies and the need to stand up and fight daily for them. On behalf of the Baltic Sea Parliamentary Conference, let me first of all thank you for the possibility to address the 51stPlenary Session of the PABSEC General Assembly and congratulate you on your 25thanniversary year. I wish you continued success and prosperous discussions for the next 25 years – at least. After Bucharest, Moscow, Belgrade, Istanbul and Kiev, this is the sixth consecutive time that we as organisations meet and discuss parliamentarism and democracy. We thereby learn from each other. We have also deepened our cooperation through bilateral visits and in the margins of a series of international parliamentary assemblies. We know each other very well, we know our mutual goals, and this is a necessary prerequisite for trusting cooperation. The active participation in our assemblies and conferences and the close contacts between our secretariats further the process of deepening knowledge of each other, mutual exchange of information as well as constantly learning from each others’ ’best practices’. We have pointed out our common goals and visions in a Memorandum of Understanding,as geopolitical areas, which stand for stability, security, democracy, economy, cultural and social development as well as the peaceful cohabitation of their peoples. Weunderlined the benefits of parliamentary cooperation based on the principles of respect of human rights and freedoms, social justice, the promotion of democracy, and the supremacy of law with regard to the interests of all states and peoples in our Regions. Moreover, we considered as a priority the objectives of guaranteeing the security of our peoples, the economic growth and labour market of our regions, and furthering cultural, economic, political, religious and social integration, based on the principles of rule of law and, at the same time, promoting respect for human rights. As the current President of the Baltic Sea Parliamentary Conference, BSPC, I want to point out once more the vital importance of international parliamentary cooperation – especially in times of tense situations. Having a forum for dialogue and exchange between parliamentarians is essential. The BSPC, consisting of 22 parliaments and five parliamentary organisations around the Baltic Sea, was founded in 1991 with the primary goal of creating a platform for open parliamentary dialogue to overcome the cold war and to establish the Baltic Sea as a sea of freedom, prosperity and cooperation. My homeland, the Åland Islands in the very heart of the Baltic Sea, are particularly aware of the need for and committed to international parliamentary cooperation because of our history. Åland is a great and real example of crisis management. Thanks to international agreements nearly a hundred years ago, we today have guaranteed, self-governed, neutralised and demilitarised autonomy in the Baltic Sea. We are a stable democracy based on the rule of law. Åland is not only a vital part of the republic of Finland. We are also known as ‘the islands of peace’. We hope to inspire others with our history of peace-making in practice. Democracies are not a law of nature. They are the products of mankind, and we must always be aware of the value of our democracies and stand up and fight daily for them to be preserved.They take centuries to build but only years to destroy. In order to include the people – our employers – in the decision-making, we have to make sure that they understand and are informed of what we do. We must also be aware of the impact the so-called ’fake news’ has on society and make sure that we are transparent and open towards the public. The truth is always superior to the lies. Finally, we must never forget the institutions that create stability in democracies. They are essential for all parliamentarians. The erosion of the institutions leads inevitably to the undermining of democracy. We must engage proactively in dialogue and cooperation. We have a responsibility towards our societies and future generations to care for our region. Participation and collaboration are a universal mandate for all of us. We might speak different languages, but our common objectives are the same: we want love, peace and a safe surrounding for ourselves and the generations to come. To achieve that, we must strengthen the influence of parliaments. We want to live in a free, peaceful and prosperous world based on democratic values and human rights. we, the PABSEC and the BSPC, have already held discussions on how we can deepen our bilateral cooperation. The BSPC is currently dealing in depth with migration and integration issues within the framework of a working group. You have also already dealt intensively with the refugee problem and migration matters which need cooperation and action. The countries of our parliamentary associations are by the sea or have a close relationship with it. In this respect, it would be useful to exchange best practice examples for the achievement of the United Nations’ 2030 goals with regard to keeping the seas clean. Mr Chairman, ladies and gentlemen, we must fight for more cooperation and less isolation. No country can solve international problems by itself. The Baltic Sea Parliamentary Conference in Åland with the participation of the President of the Republic of Finland on 27 August 2018 will offer dialogue, debate, solutions, friendship and a strong will to increase cooperation and prosperity in the region. We will also include the young generation in our deliberations – as we regularly have done at our former conferences – and give them the opportunity to discuss their recommendations on the United Nations 2030 development goals which they will elaborate one week before at a youth summit called Regeneration 2030. We are the Islands of Peace, and we want the whole of the Baltic Sea and the rest of the world to follow our example: for the benefit of hope and the never-ending search for a better life.